This lesson teaches students how to apply information about normal distributions, means, standard deviations, and z-scores from real life data about height. The focus of this lesson is conceptual understanding; students will not be computing any standard deviations. 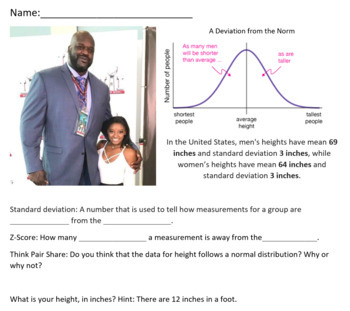 However, they will use a given mean, standard deviation, and normal distribution to compute z-scores and percentiles for their own height, their classmates' heights, and celebrities' heights.